Welcome to Clinical Formula Online Store! SKIN TYPES	For all Skin Types. 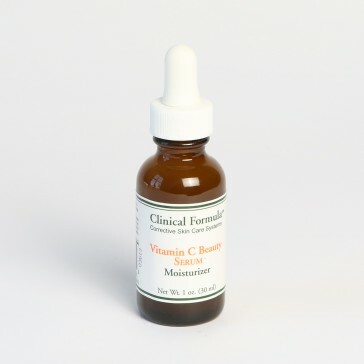 Vitamin C Beauty Serum specially formulated from a combination of high potency natural Vitamin C. Helps reduce the visible signs of aging, rejuvenates the skin. Improves skin elasticity, firmness and tone. Provides excellent moisturizer, anti-oxidant, and helps rejuvenate the skin . Reduces the visible signs of aging, rejuvenates the skin. For better penetration of Active ingredients. Tetrahexyldecyl Ascorbate; a stable form of Vitamin C, Antioxidant. Citrus extract; a natural antioxidant, reduces the visible signs of aging, rejuvenates the skin. Magnesium Ascorbyl Phosphate; a stable form of Vitamin C, Antioxidant. Vitamin E Acetate; an antioxidant and skin healer that moisturizes and protect, improve skin elasticity, firmness and tone. Aloe Vera; for its healing and soothing properties to reduce the sign of irritation. Dimethicone; a skin barrier, protects from moisture loss. Panthenol; Pro Vitamin B-5, which aids in calming or healing dry, irritated and sensitive skin. Softens, plumps and smooths the skin. Apply small amount to a clean skin and massage gently with fingertips, apply as desired. For best results, apply at night and morning. Deionized Water, Aloe Vera Gel, Glycerin, Propylene Glycol, Tetrahexyldecyl Ascorbate, Citrus extract, Hydroxyethylcellulose, Dimethicone, Panthenol (Pro Vitamin B-5), Magnesium Ascorbyl Phosphate, Vitamin-E Acetate, Phenoxyethanol, Caprylyl Glycol, Tetrasodium EDTA. For external use only. Avoid contact with eyes and eyelids. Keep out of reach of children. © Clinical Formula™ 2008-2013. All rights reserved.